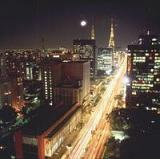 Sao Paulo is huge: the largest city in all of Latin America! Such a megalopolis was formed through a long and complex history. Each neighborhood seems a testament to a different period of the city's history. Sao Paulo's first inhabitants, Jesuit missionaries and treasure-hunting pioneers, lived in the largely pedestrians-only hilltop and valley areas, particularly Vale do Anhangabaú. Later these areas became Centro (downtown district), a financial and cultural center that's still home to the stock exchange and many banks. It's now the focus of revitalization efforts. The Bela Vista and Bixiga (the city's little Italy) neighborhoods, near Centro, are home to many theaters and bars. In the 19th century many families who made fortunes from coffee built whimsical mansions in the ridge-top Avenida Paulista neighborhood. Beginning with the post-World War II industrial boom, these homes gave way to skyscrapers. Many of the best hotels are also on or near this avenue. During the economic growth of the 1970s, many businesses moved west and downhill to a former swamp. You'll find the tall buildings of Avenida Brigadeiro Faria Lima, the stylish homes of the Jardins neighborhood, and the Shopping Center Iguatemi (Brazil's first mall) just off the banks of the Rio Pinheiros. Nowadays, large-scale construction of corporate headquarters continues south, between the Marginal Pinheiros Beltway and Avenida Engenheiro Luís Carlos Berrini, not far from the luxurious Daslu. Read about weather of this region and all of Brazil here. Travel to Brazil with AR Tourism and our premier travel partners. We provide your with quality information prior to the trip, and make sure you have the best experience on the trip.